BruBotics is a multidisciplinary center of knowledge of the Vrije Universiteit Brussel that delivers excellent research, education and services in the field of Human-Centered Robotics. Acting in an international, national and regional context, BruBotics studies how the quality of life and the working conditions of all members of our society can be improved through Human Centered Robotics. Extensive valorization ensures that BruBotics has a positive and lasting impact on both society and industry. The BruBotics consortium aims to become one of the top influencers in the European Human Robotics ecosystem. 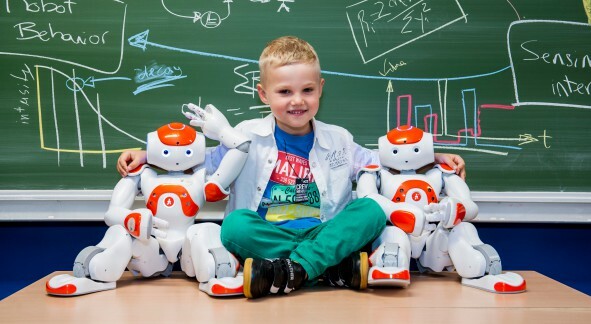 In order to do so, BruBotics has defined a number of clear strategic goals and KPI's, such as participation in key European projects, the organization of several human robotic educational programmes, and membership of leading organizations. The impact of a research organisation is in part determined by how succesful the results are transferred to the society. BruBotics aims to place a larger emphasis on this, by aiming to launch several spin-offs and work more closely together with the industry and society. The essence of BruBotics is of course our research and education. Excellent education is needed to have excellent people. Excellent people are needed for top notch research. And top notch research forms the basis of all valorisation activities.